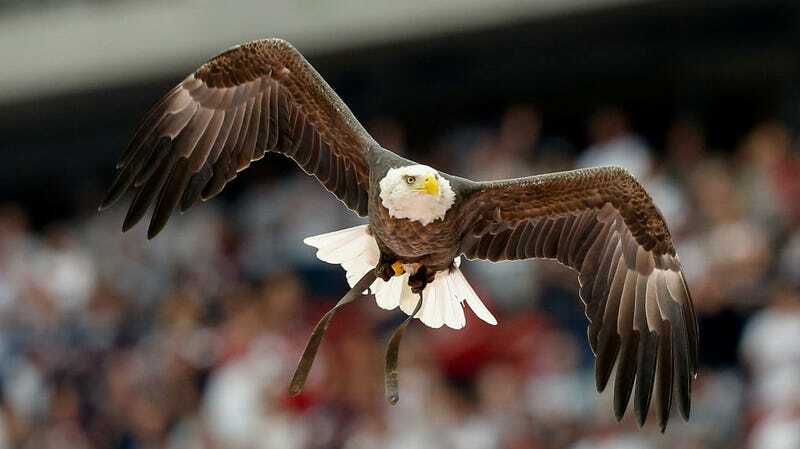 Bald eagles, the majestic symbol of American patriotism, are also, apparently, giant trash birds. As reported by Motherboard, there are approximately 200 eagles that have made their home in the Renton, Washington landfill and, much to the dismay of local residents, their favorite activity involves scooping up bits of old food and wet trash and dropping it all over town. While the vision of a hoard of eagles subsisting on a diet of rotting garbage may sound like a poorly constructed political cartoon, it is, in reality, turning into quite a problem for Washingtonians and environmentalists alike. “The eagle population has exploded in the last five years, and why? Because they have a free lunch at the dump,” speculates David Vogel, one of 80 local residents who confronted the city council about the eagle blight at a meeting covered by the Seattle Times. As if the visual metaphor needed to be any more confused, Vogel recently discovered a biohazard container filled with human blood that an eagle had deposited on his property, presumably as a warning. According to Motherboard, the county is currently workshopping a humane method for dealing with the federally protected birds who appear to be thriving in the 920-acre landfill. There are some residents, though, who would prefer the landfill to close altogether, forcing these trash turkeys to return to the wilderness where they can get a more natural diet. Whatever the solution, we’re sure these patriotic dumpster divers will find a way to survive, and definitely aren’t a warning sign that our country’s moral center has crumbled beyond recognition.